VirusBuster is not the most well known antivirus and is actually Hungarian. 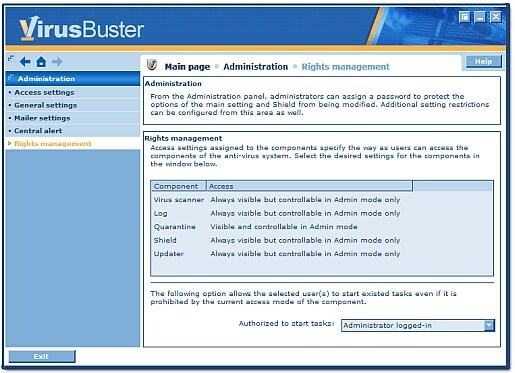 However, the most exciting thing about VirusBuster is that version 7 was awarded the VB100 award for February 2011. This means that the software really does provide the most current protection against the latest threats. The program also has ICSA, WestCoast (specifically for anti-trojan detection), and CheckVir certifications. The only thing that seems to be moderate is the interface. However, it’s a tradeoff for better resource management (excellent in tests) and responsiveness. The installation of VirusBuster was good. The download size was 65.8 megabytes and separate setup files are needed for the 32 and 64 bit versions. The installer worked great on Windows 7 and gives the user the option to input an update sever address (ideal for a small business setting). Once finished, the installer prompted for a restart even though the program launched. 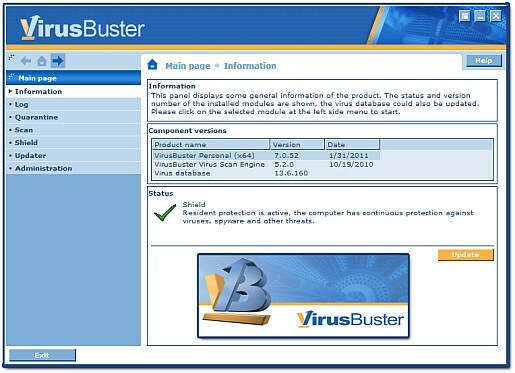 VirusBuster also auto updated and time stamped the updates after the install. 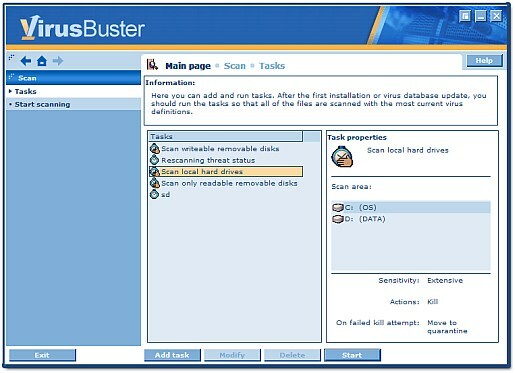 VirusBuster breaks down the scanner setting into tasks which are predefined but can also be customized by the user. The predefined scans are the local hard drive, readable and writable removable disks, and rescanning threat status (rechecks quarantined files) scans. The local hard drive scan, scans at about 5 megabytes per second which slightly higher than the benchmark free antivirus. The default setting is to first delete the file and then quarantine it if that fails. I personally liked the logging capability which is presented as a main function of the antivirus. If a file is access denied or there are access restrictions the user will be immediately notified with a detailed explanation. Unfortunately a quick scan isn’t a predefined profile but can be added via the tasks menu. A user can also customize the schedule of the scan, whether it scans networked drives (accesses networking neighborhood), and if default extensions are included or all extensions. The user defined scans can be easily accessed via the tray icon. The local hard drive scan finished in a quick 1 hour and didn’t detect any false positives or viruses on the test system. 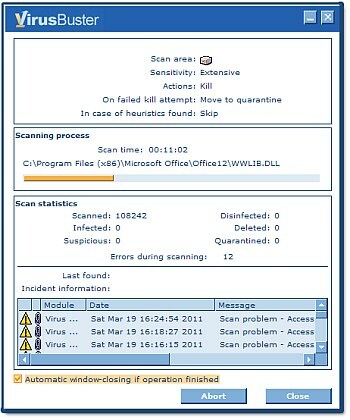 In addition to on demand scanning, VirusBuster offers a real time shield. The protection or sensitivity level can be set to either weak, medium, or high. The real time shield is also very efficient at scanning files while idle and had already checked 24,183 files just after about 1 hour of use. The updater offers several ways to update over most free antivirus including http, ftp, a specific path, netware, or even via a CD or flash drive. Updates are also delineated into tasks and can be set to update on restart and/or login and even where definitions versus program updates are received. 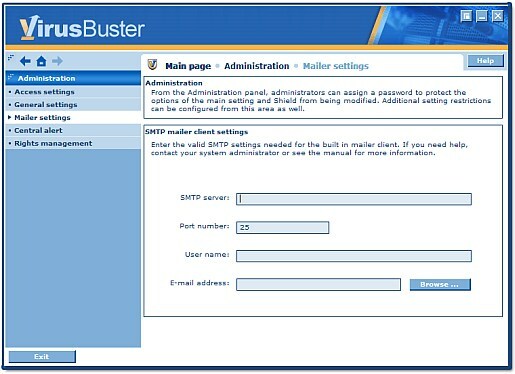 In the advanced settings one can set an administrator password and even an smtp server to send alerts to. There is also a rights management area where one can set if the antivirus can be modified and by whom. VirusBuster has excellent resource management. While idle the program used approximately 21 megabytes of RAM via two services vbcmserv.exe and vbsystry.exe. During scanning an addition process quick scan process starts (6 megabytes in size) then disappears and RAM usage never exceeds 32 megabytes. I also didn’t detect an increase in startup or shutdown times. CPU usage is anywhere from 5 to 12 percent. VirusBuster clearly has one of the most efficient antivirus engines. The only complaint is the interface. The publisher really needs to update it to compete with other mainstream antivirus. I would also like to see some more customization settings.